K9 COACH is an inhome dog training company. Hans from K9 Coach generously offered advice here to past questions. This advice is offered to assist Oz Doggy visitors with some of their dog training questions. If you live in Melbourne, you can hire the K9 Coach direct to your door. 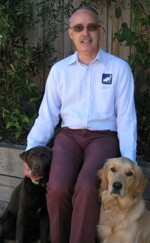 K9 Coach was formed by Hans van Heesbeen, who was the Victorian Master Franchisee for 4 1/2 years of a very well known and established international inhome dog training company. Contact the K9 Coach (Melbourne based) for onsite training services. My 1yo male Rottweiler has peed on a behaviourist, my husband, my female dog and my 6yo daughter. My 2yr old chihuahua x mini foxy is completely toilet trained and will go on command. How do we stop her barking inside and outside,is the muzzle cruel, she is usually a very active dog that loves to be with us and licks us alot. Would a dog be severely affected by a blue bottle sting? A friend has told me that I can soothe my nervious dog during a storm by giving him a small amount of brandy mixed with rescue remedy,diluted with water. I have a 2.5 yr old Female Blue Heeler that has just started weeing herself when I return from being away from her for a few hours. What's the smartest way to curb this problem. How do you deal with a situation where a puppy has dug in pot plants during the day while you are out and you obviously have not caught it in the act? What strategies can i do to help my dog adjust to the new environment? Do you have any remedies for keeping possums away from the property, as my large dog likes to chase them? Jessie, is a kelpie and whenever we are at obedience school she constantly barks at other dogs. Disrupts the class, and will not learn, as she is continuously barking. Help! When I left the house today she cried at the back door. She was good now I'm home again I just don't want her crying and winpering while I'm away and annoying the neighbours. What can I do. I'm looking at a Maltese pup, it's 5 weeks, too young to leave mum, anyway, the owner said she was developing as fast as her brother, what did she mean? I have a nearly 2 year old German Shepherd who has an obsession with rabbits. Is there anyway of getting rid of this obsession with rabbits?? 6 year old female Rottweiller X Ridgeback recently started digging under the fence just to get to the front door and wait for me. What could you recommend we do to get him to go through it on his own? HI, We live on a large farm and have a working kelpie dog and a pet Labrador dog. They are both starting to chase cars as they leave or arrive. Is it hard to train a CKCS at such an age now?